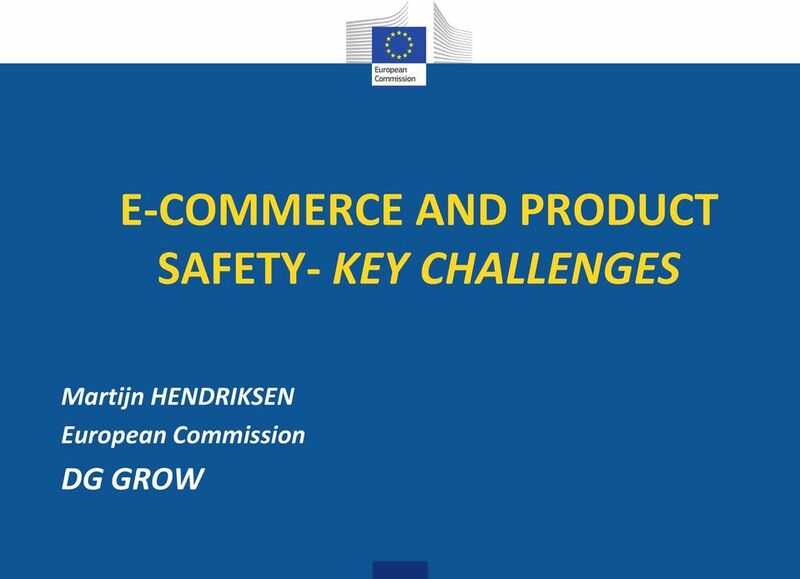 Download "E-COMMERCE AND PRODUCT SAFETY- KEY CHALLENGES"
6 New Approach - Scope Electrical / electronic products Pressure equipment / Gas appliances Toys Personal protective equipment Machinery Medical devices Radio and telecom equipment Lifts ATEX equipment Recreational craft etc. 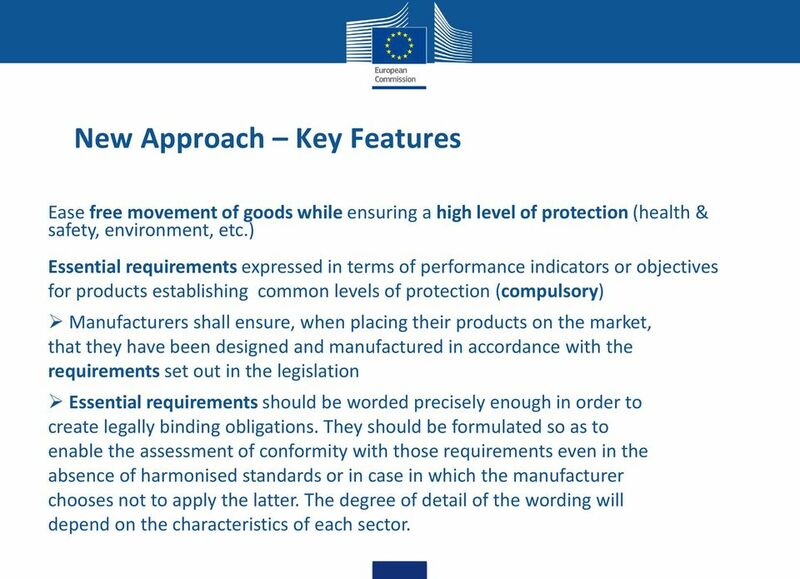 7 New Approach Key Features Ease free movement of goods while ensuring a high level of protection (health & safety, environment, etc.) 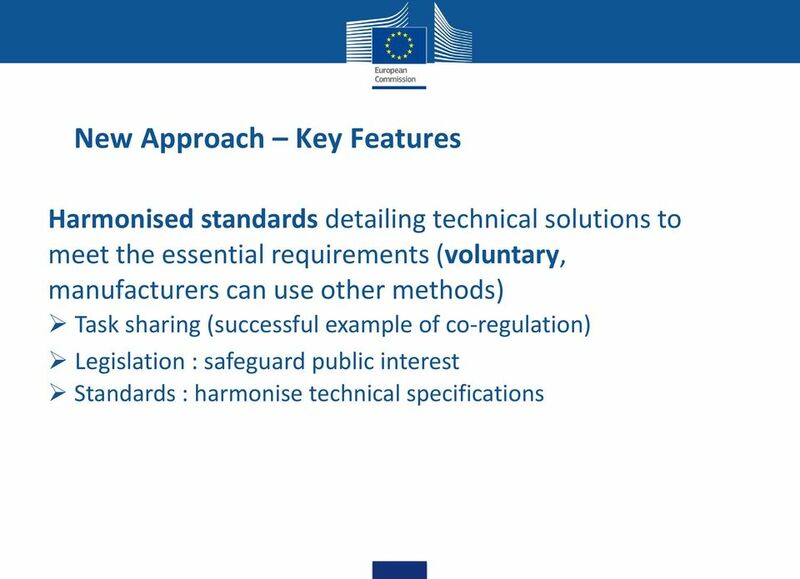 Essential requirements expressed in terms of performance indicators or objectives for products establishing common levels of protection (compulsory) Manufacturers shall ensure, when placing their products on the market, that they have been designed and manufactured in accordance with the requirements set out in the legislation Essential requirements should be worded precisely enough in order to create legally binding obligations. 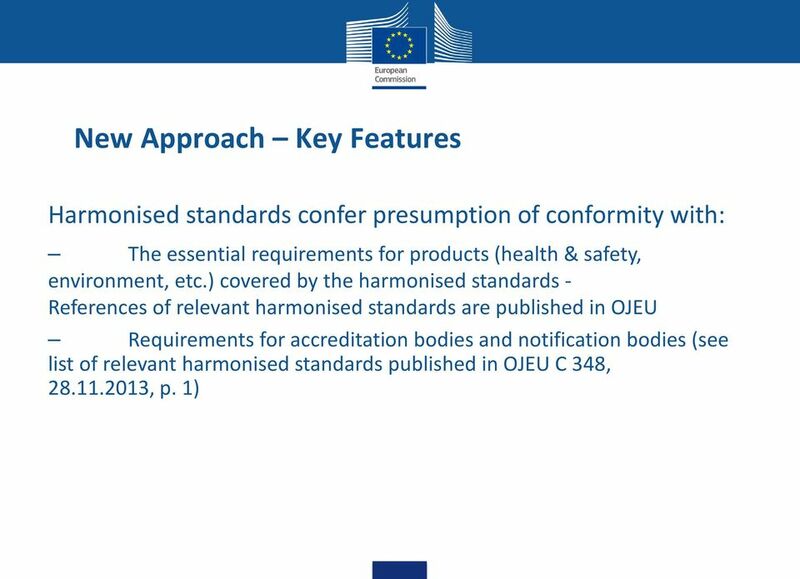 They should be formulated so as to enable the assessment of conformity with those requirements even in the absence of harmonised standards or in case in which the manufacturer chooses not to apply the latter. 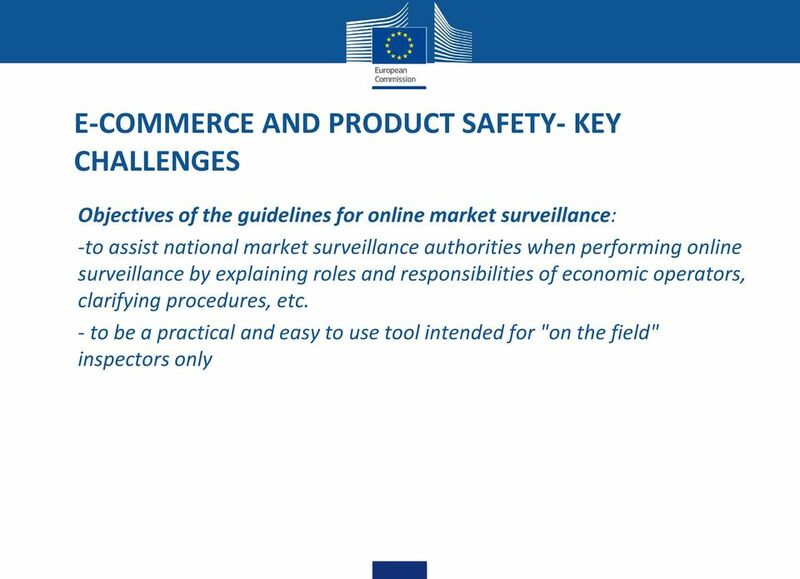 The degree of detail of the wording will depend on the characteristics of each sector. 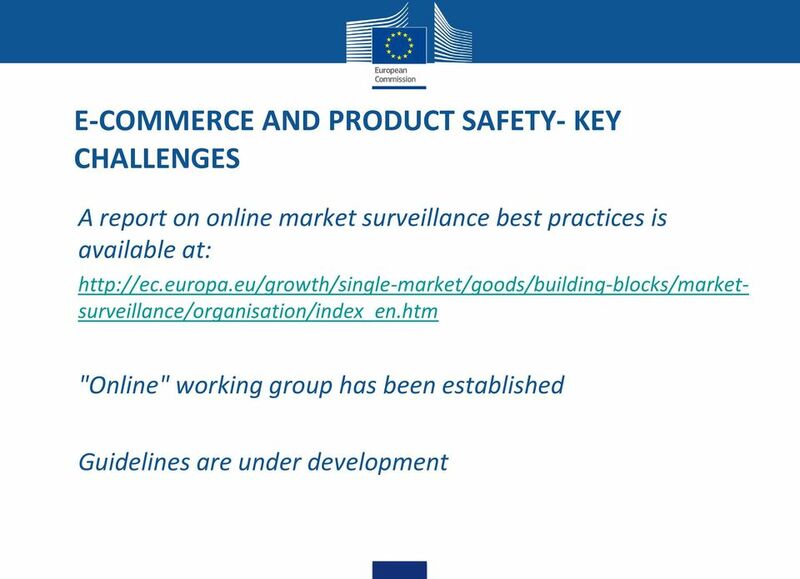 13 E-COMMERCE AND PRODUCT SAFETY- KEY CHALLENGES Example (1): A EU consumer buys directly from a web shop located outside the EU and receives the (non-compliant) product directly home. 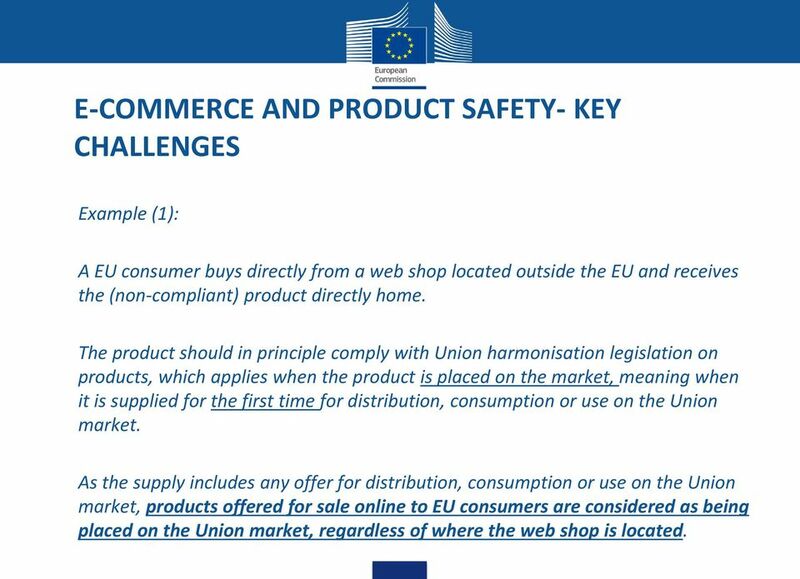 The product should in principle comply with Union harmonisation legislation on products, which applies when the product is placed on the market, meaning when it is supplied for the first time for distribution, consumption or use on the Union market. 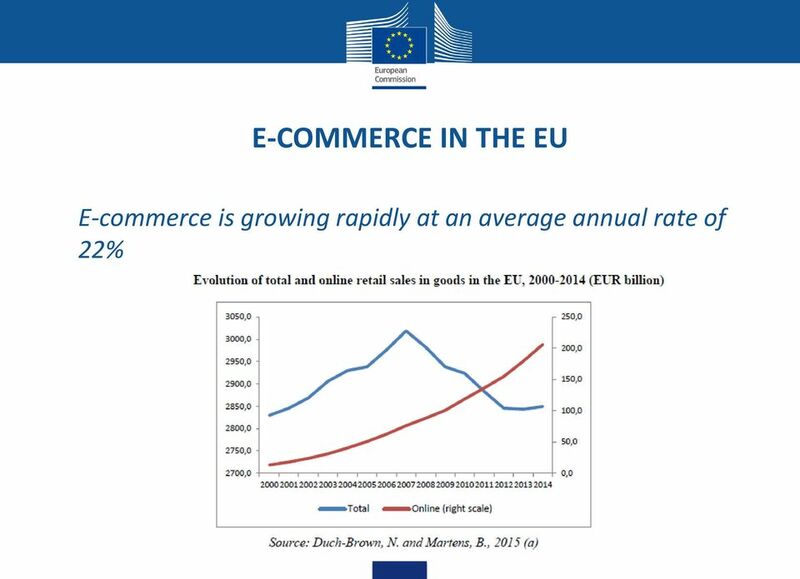 As the supply includes any offer for distribution, consumption or use on the Union market, products offered for sale online to EU consumers are considered as being placed on the Union market, regardless of where the web shop is located. 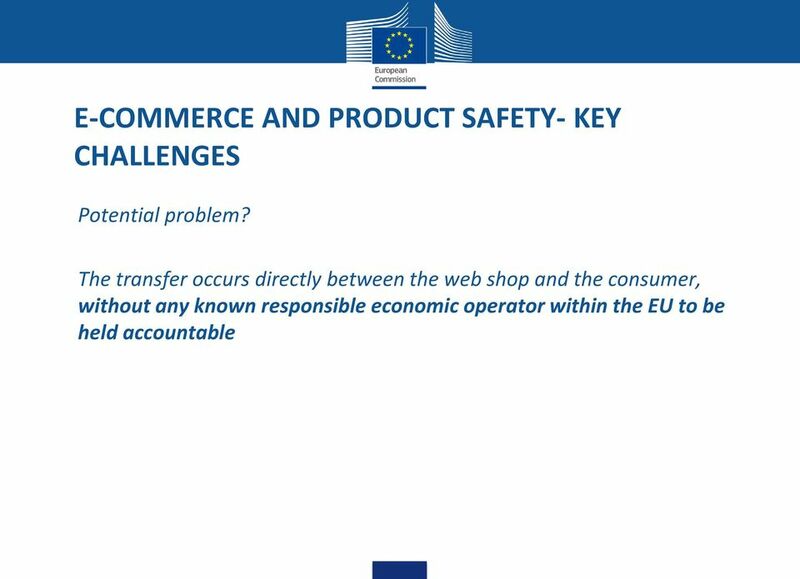 15 E-COMMERCE AND PRODUCT SAFETY- KEY CHALLENGES Example (2) A EU consumer buys directly from a web shop located outside the EU and receives the (non-compliant) product directly home. 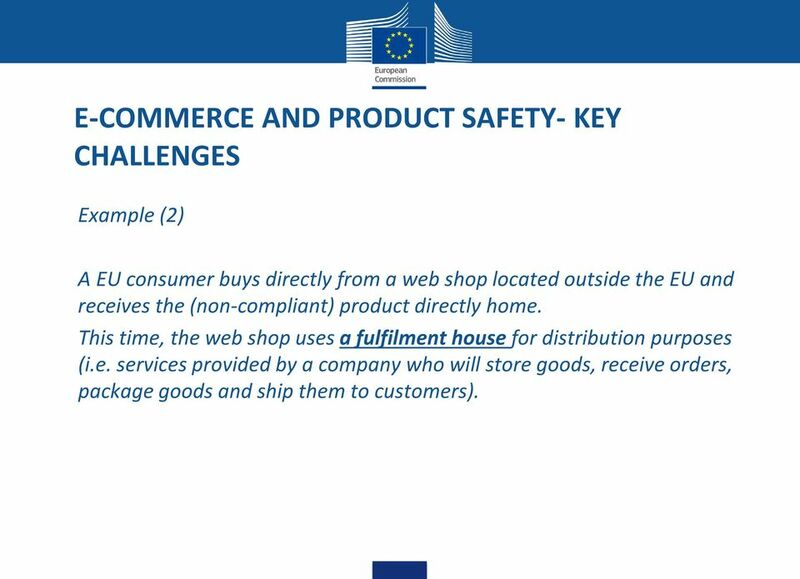 This time, the web shop uses a fulfilment house for distribution purposes (i.e. services provided by a company who will store goods, receive orders, package goods and ship them to customers). 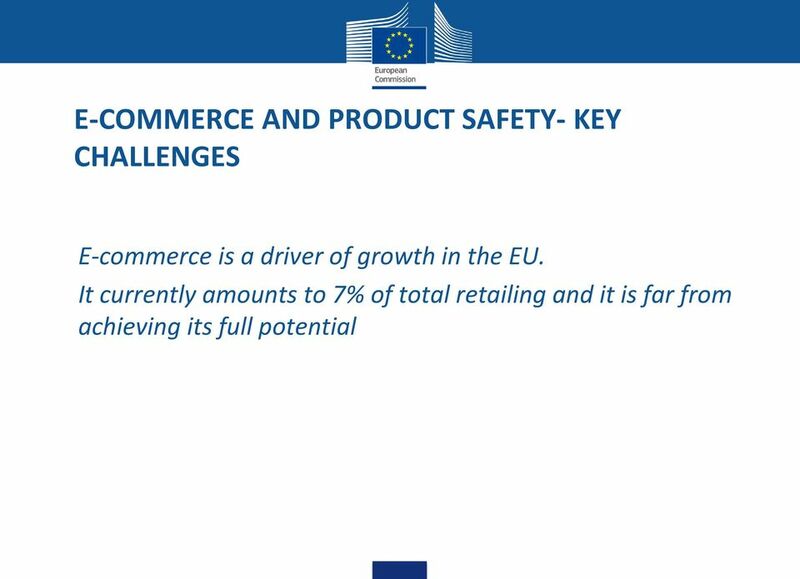 17 E-COMMERCE AND PRODUCT SAFETY- KEY CHALLENGES Potential problem? 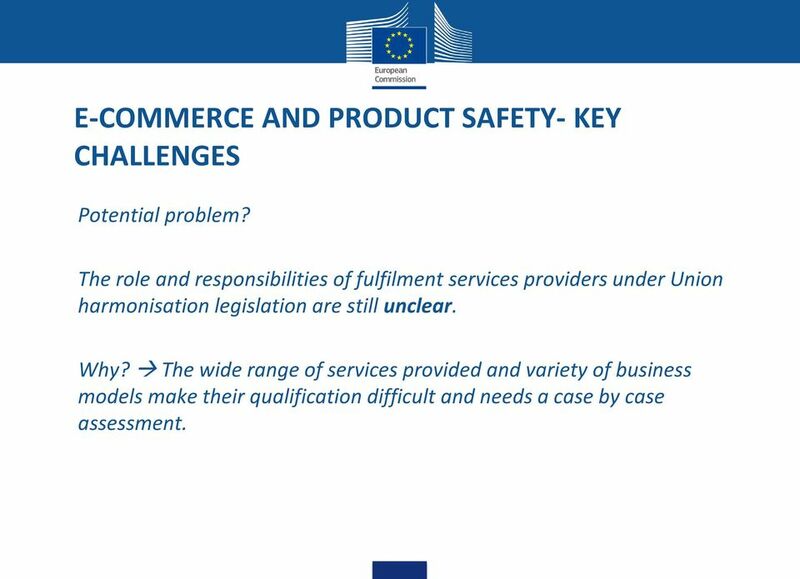 The role and responsibilities of fulfilment services providers under Union harmonisation legislation are still unclear. Why? 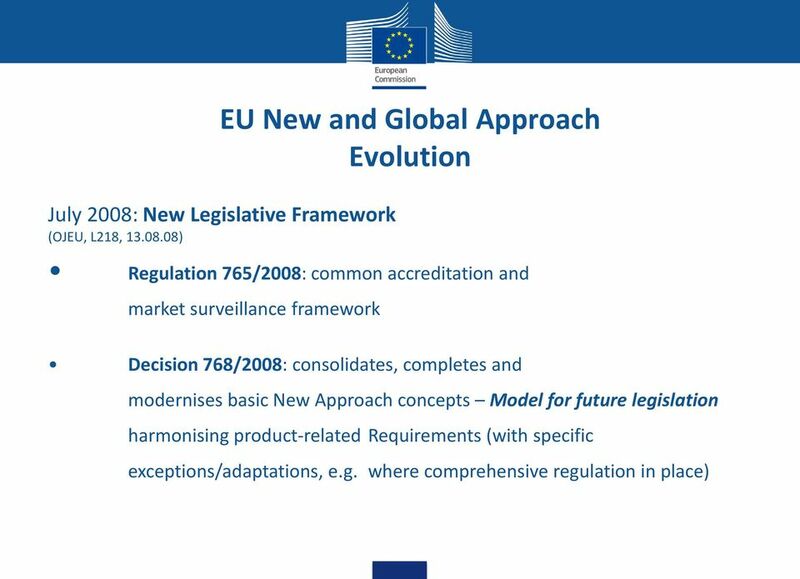 The wide range of services provided and variety of business models make their qualification difficult and needs a case by case assessment. 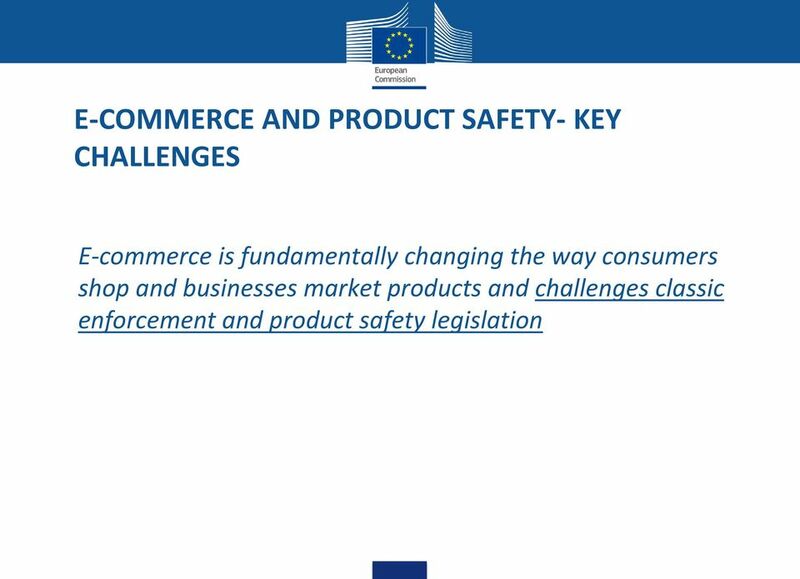 18 E-COMMERCE AND PRODUCT SAFETY- KEY CHALLENGES How to address these challenges? 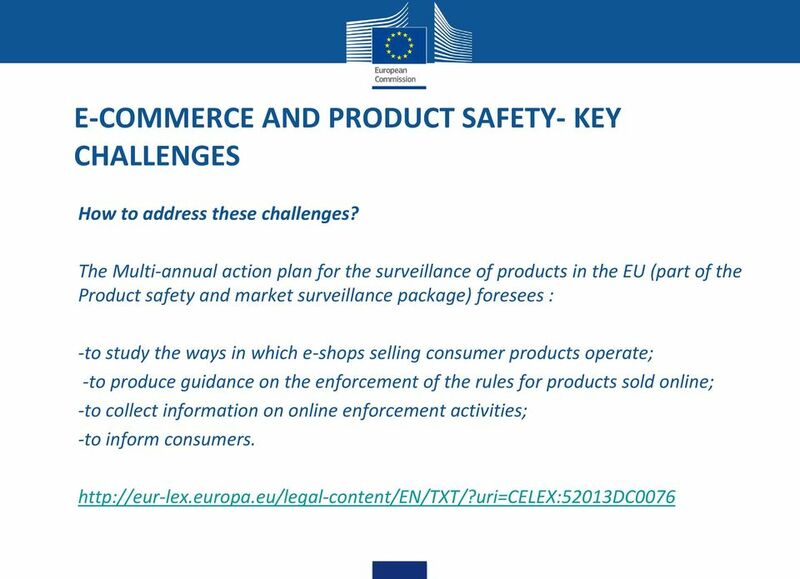 The Multi-annual action plan for the surveillance of products in the EU (part of the Product safety and market surveillance package) foresees : -to study the ways in which e-shops selling consumer products operate; -to produce guidance on the enforcement of the rules for products sold online; -to collect information on online enforcement activities; -to inform consumers. 22 THANK YOU FOR YOUR ATTENTION! 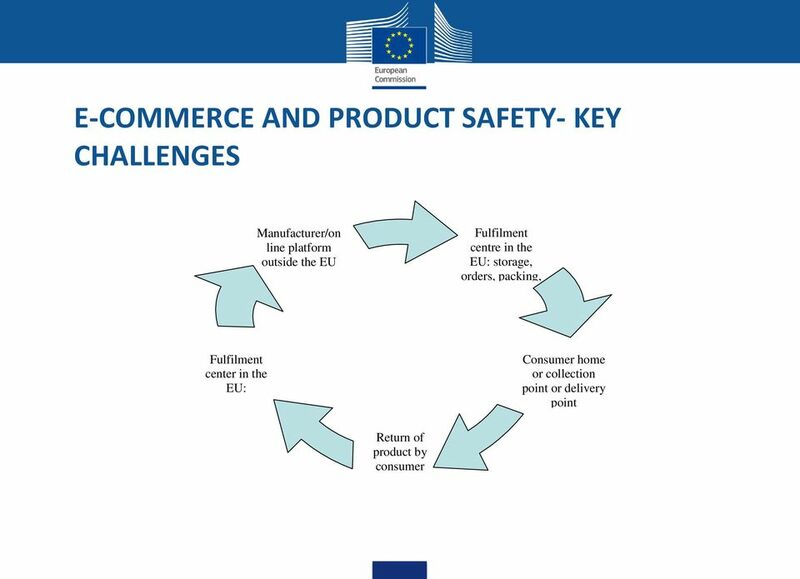 Introduction Many products that are sold in the EU bear the CE mark. 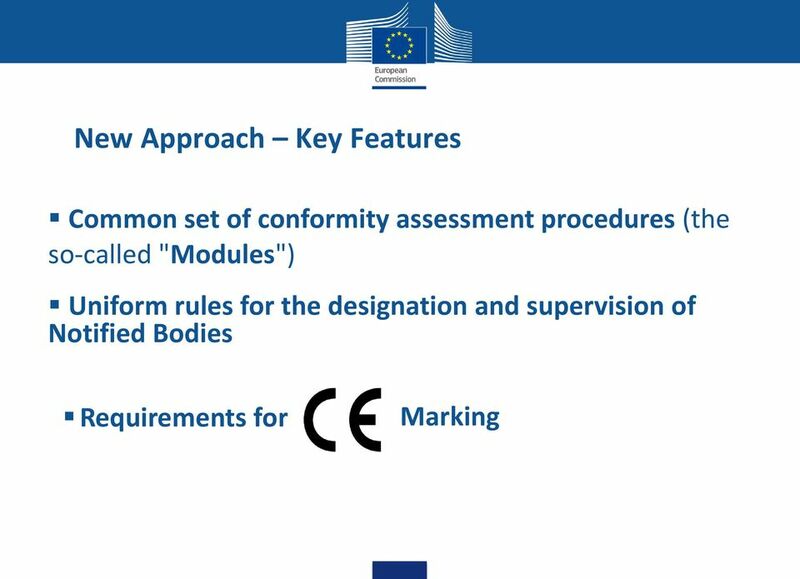 This indication became first mandatory in 1990 but it took no less than 3 years before the CE mark obtained its present graphic form. 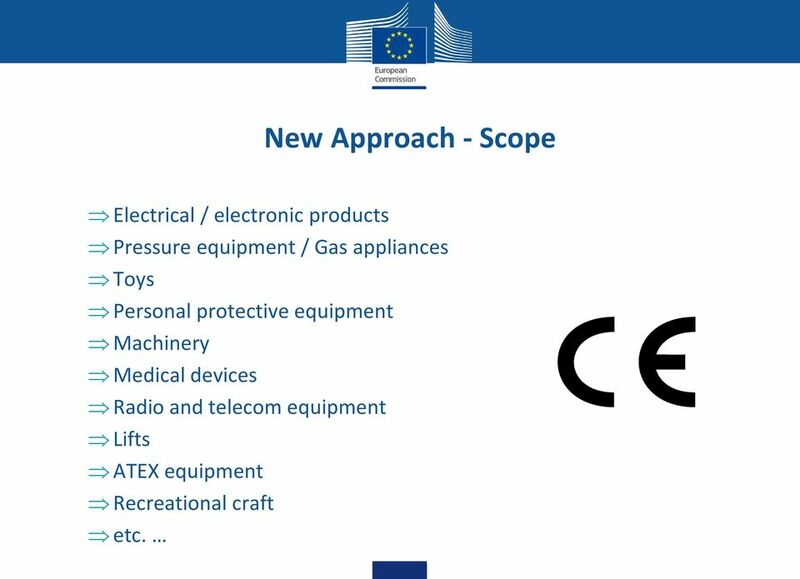 CE marking makes Europe s market yours! 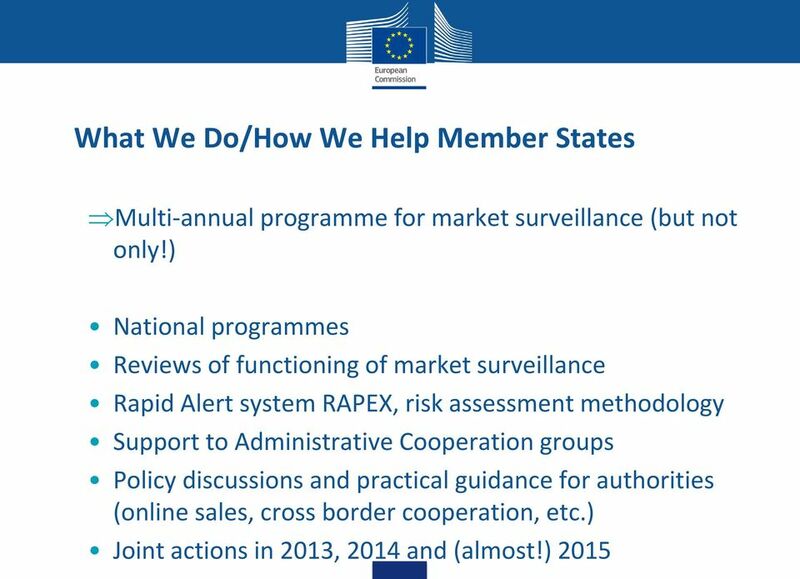 The Danish Energy Agency will carry out inspections in October 2013. 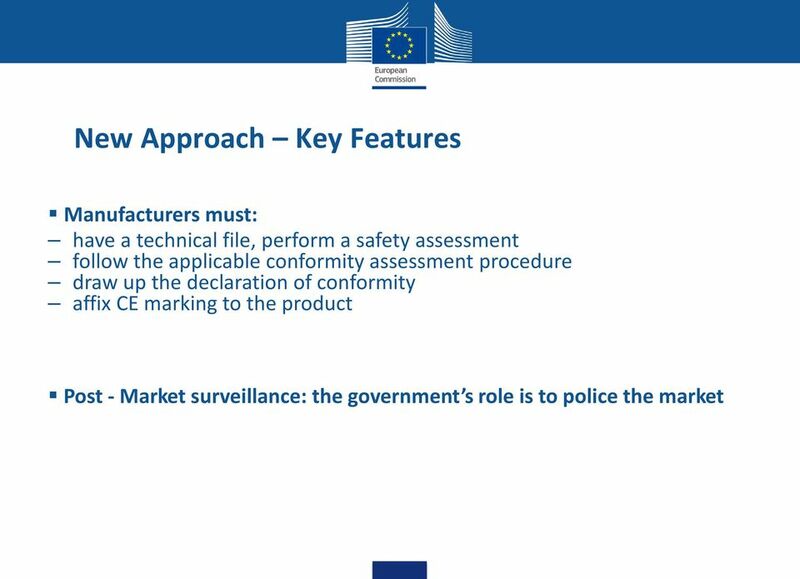 We will check the CE marking of the smoke alarms you sell or use. What should be in a Declaration of Conformity?